LEAGUE CUP FINAL: Will Ballymena or Carrick make history this weekend? 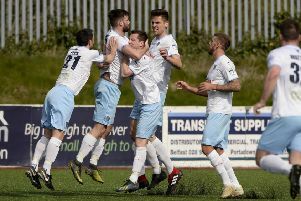 History will be made on Saturday as either Ballymena United or Carrick Rangers will win the League Cup for the first time. When the League Cup first started back in 1987 it featured all 32 clubs from the Irish league and B Division. The competition remained in this format until 1998 when it was changed to only senior clubs before it was opened up to include the 17 Championship clubs in 2008, and again in 2010 to include clubs from Championship 2, after the Championship 2 League Cup was abolished. In the early 2000s a group stage followed by a knock-out system was used instead of the straight knock-out system, and for two seasons (2008–09 and 2009–10) two-legged home and away aggregate ties were used up until the quarter-finals, instead of single matches. The actual trophy presented to the winners is the old City Cup, which was another senior Irish League competition that was discontinued in 1975. The first final took place on 9 May 1987 at Glentoran’s ground, the Oval, and was contested by Linfield and Crusaders. Linfield became the inaugural winners of the cup, defeating Crusaders 2–1. Linfield have gone on to win the competition nine times overall – more than any other club. They have appeared in twelve different finals, which is a record they share with rivals Glentoran. Cliftonville have won the competition in four consecutive seasons, which is the record for the most consecutive wins. The 1988–89 final, played between the Big Two at the Oval on 11 November 1988 was won courtesy of a goal by Glentoran goalkeeper Alan Patterson, via a kick from his own penalty area. This was the first time that a goalkeeper had ever scored in a British football final. Thirteen different clubs have reached the final, but only ten clubs have won the cup and only five of them have done so more than once. Ballymena United, Larne and Newry City are the three clubs to have played in the final but never won.